This is the second of four articles focused on the Liberating Voices practicums conducted for the two Public Thinking Public Health classes held at Evergreen College at the end of 2009 and beginning of 2010. A slide presentation of completed “game boards” is provided on the first article of this series. This article focuses on the team work sessions that formed the heart of the practicums. A representative selection of the pattern cards used in these practicums can be found as pdfs here. The opening team work session for the first Public Thinking Public Health class in 2009 called for all teams to work on the same scenario as a common exercise. Additional parameters were incorporated into this exercise, which is recommended as an initial exploration of Liberating Voices. 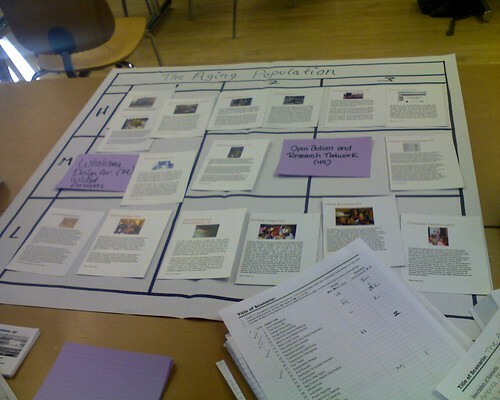 While all teams focused on the same civic challenge (gentrification), each team was also assigned different social/financial/time constraints, for example, one team was to see itself as a neighborhood community council building a three-month action plan with little or no available funding. Explicitly acknowledging these actual constraints in real-life workshops is a critical component for grounding the use of the pattern language. This approach was not repeated in the second class in 2010 to allow for an afternoon focus on Action Planning. The plotted “game boards” for all six teams (although, alas, not the specific identifying constraints) are available for comparison in the Sample Practicum Procedures and Reports packet. Each team discussed the specific focus of their project and then dealt out cards for each team member to review on behalf of the entire team. This positioned each team member to have greater familiarity with selected patterns, and therefore strengthen the team’s ability to work with a relatively large number of patterns without having to take time for everyone to learn them all. Teams then selected their own process for “playing out” the hands, which involved selecting applicable cards and plotting them by their relative weight or priority for the issue at hand as well as a rough sense of sequencing, that is, which patterns would tend to be more useful earlier, and which later, in the overall flow of resolving the issue. Teams were also encouraged to use the blank cards to add additional patterns from Liberating Voices that had not yet been prepared as cards or to even suggest new patterns. While teams were told they did not have to use every pattern, no limit on the number of selected patterns was prescribed. Overall, teams tended to select roughly 20 or so patterns. After some initial hesitancy and process deliberation, teams completed this task in about half an hour. Virtually every team reported they had gained deeper insight and greater clarity on the issues and opportunities of their specific project. For the second work session in the 2010 Practicum, teams were asked to select one pattern or cluster of patterns that appeared to be the most strategic starting point for action planning. 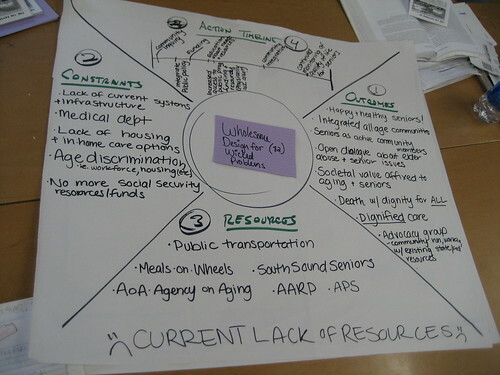 They placeded that pattern or cluster at the center of the Action Planning “game board” and then worked through the various dimensions of action planning: (1) outcomes, (2) constraints, (3) resources, and (4) action timeline. The next article will focus on the documentation of results from the practicums.